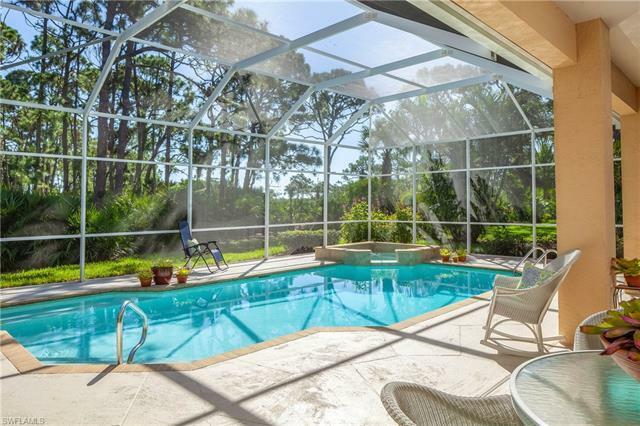 24901 Goldcrest Dr, Bonita Springs, FL.| MLS# 218053670 | Southwest Florida Residential Real Estate for Sale. This home captures the tranquility of the outdoors with the sweeping natural landscape and golf course beyond. A completely private peaceful setting. It has the Best of Everything...right size three bedroom plus den with three full baths, 2000 SF of covered lanai and pool deck entertaining area, a 2 car garage with great storage, 5 ton 15 seer AC installed in 2015, New roof 2016, cornerstone kitchen in 2007 & master bath 2009. It is light and bright and well maintained. There are so many highlights of this home evoking charm everywhere you look it has certainly proven to be the envy of the neighborhood. Selling Agent: Amy Velyvis P.a.